Advance Physical Therapy (Valley Stream) - Book Appointment Online! 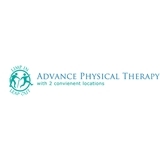 Advance Physical Therapy has been serving the community for nearly 30 years. We combine the highest quality health care with a personalized approach to your rehabilitation. You will receive one on one care to help you achieve your goals as quickly and efficiently as possible. Professional and knowledgeable about how to help relieve pain caused from nerves. Awesome, PT! Super knowledgeable, kind, and patient. Showed me some stretches, and was kind enough to squeeze me into her schedule.